As you can see, the beer market has been growing over the past year, and craft beer is a large part of that growth, with craft beer sales growing at an annual rate of 8%! With these numbers, it is clear to see why you would invest in starting your very own brewery. 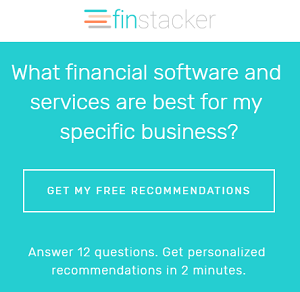 In order to do this, you will need to create financial projections unique to your business for lenders or investors to view before they decide to take a stake in the company. 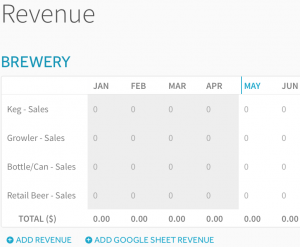 ProjectionHub.Com has a financial template specifically for breweries that integrates a Google Sheet revenue model for more customizable and accurate financial projections. This post will show you step-by-step how to utilize this tool to create your custom financial projections. Feel free to learn more about ProjectionHub in general before signing up. 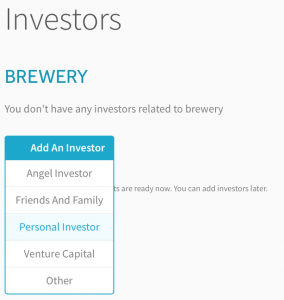 You can sign up for a free trial by selecting the “Brewery” template here. 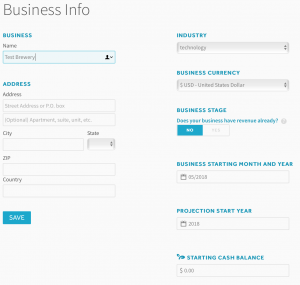 Once you save the general business info, you will be able to add a business model. 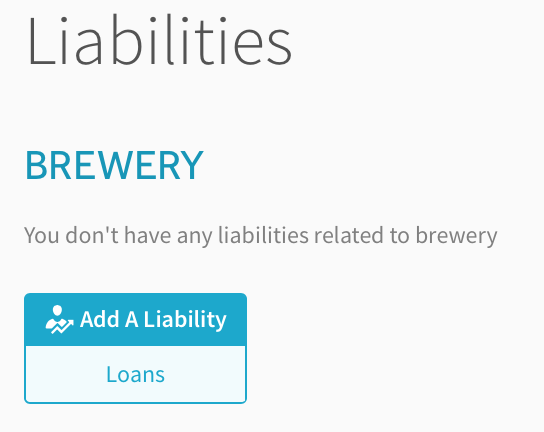 If you don’t already see a Brewery Business Model added on this page, you can click the add Business Model button as seen below to add your first Brewery unit. Next you can click the orange button to Add Revenue to get started with your sales projections. You can click “Add Revenue” which will give you the ability to add projected revenue numbers for each month for your brewery. 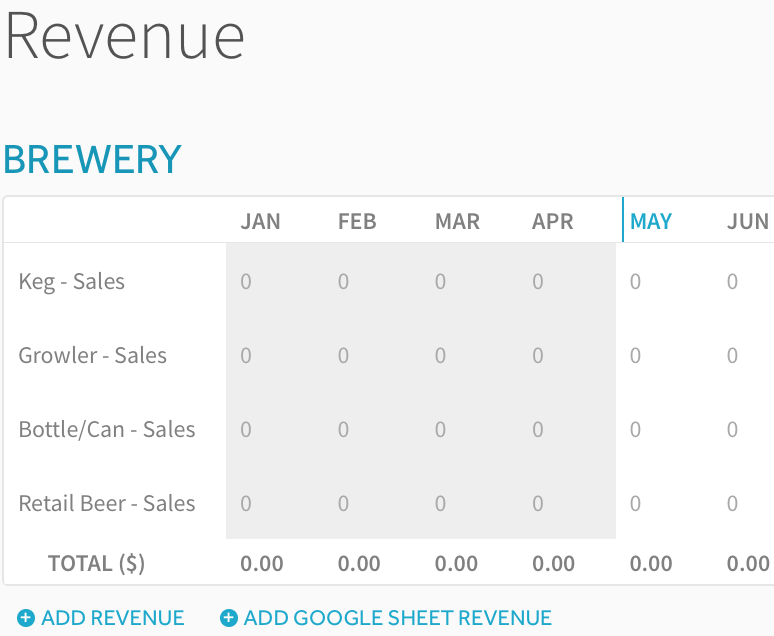 Or you can click “Add Google Sheet Revenue”. We have created a special Google Spreadsheet template specifically for Breweries that will give you more control in terms of adding assumptions for your average ticket price and number of customer orders each month. 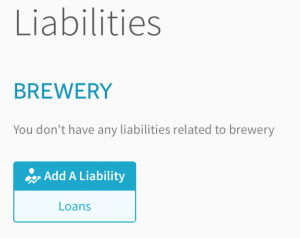 If you are creating a set of projections for a startup brewery this list of startup expenses and ranges comes from ProBrewer.com. 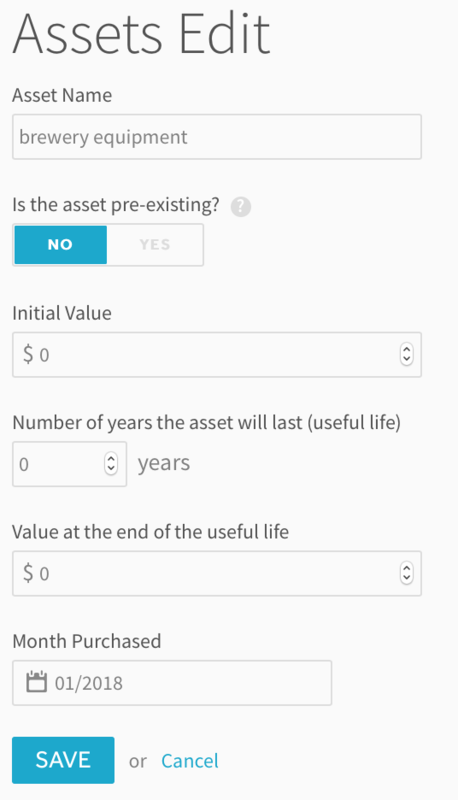 If you have any of these types of expenses you will want to add them later as an “Asset” instead of an “Expense” on this page. 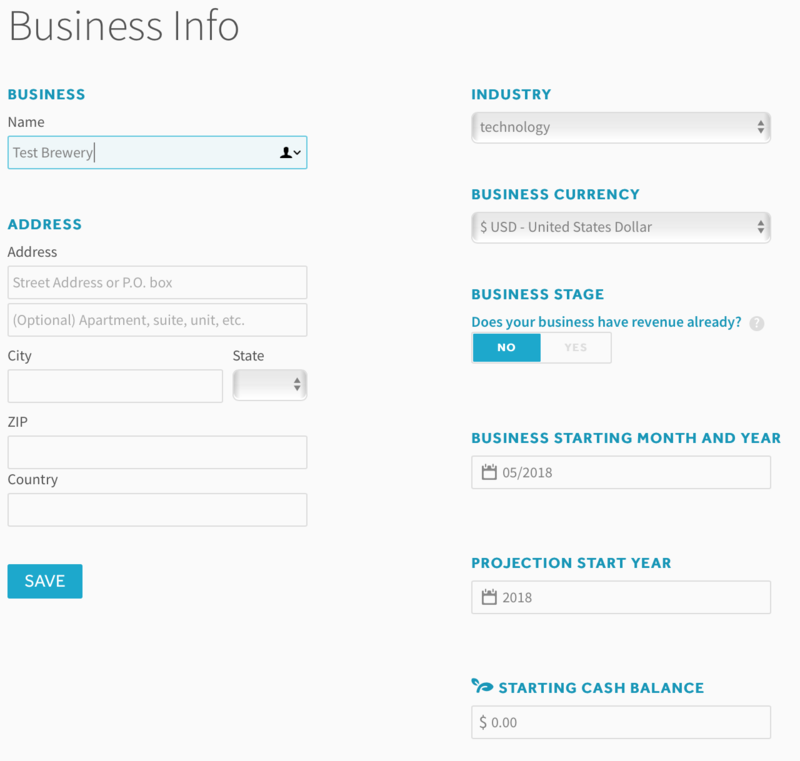 On the Expenses page in ProjectionHub you will be able to add/update your operating expenses. You will notice that the Expense page will come with a number of standard expense line items along with a default monthly expense for most of the line items. Obviously you can change any of these default expenses to reflect your specific situation. Some expenses will be a % of your total sales, instead of a fixed monthly amount. 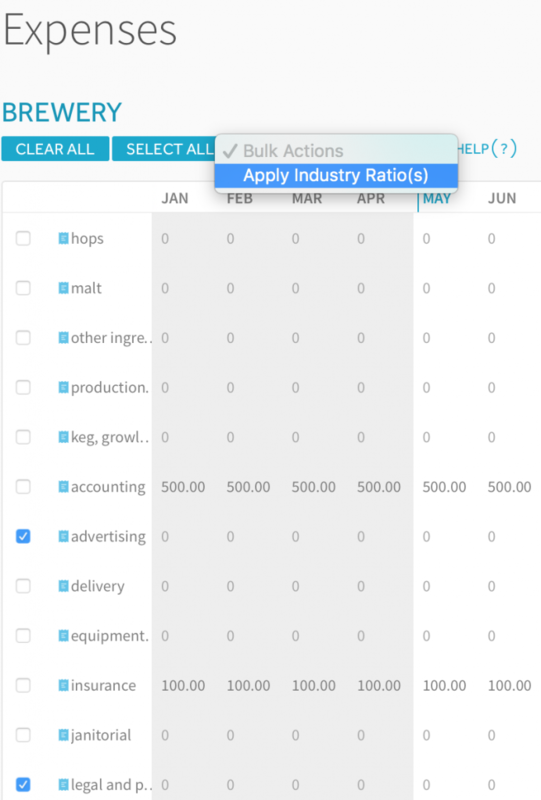 So as you see in the image above you can click the check boxes next to those expense categories and then in the drop down box you can select “Apply Industry Ratios” and then click “Apply”. 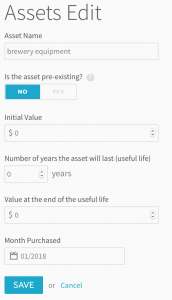 Next you can move on to the assets section. 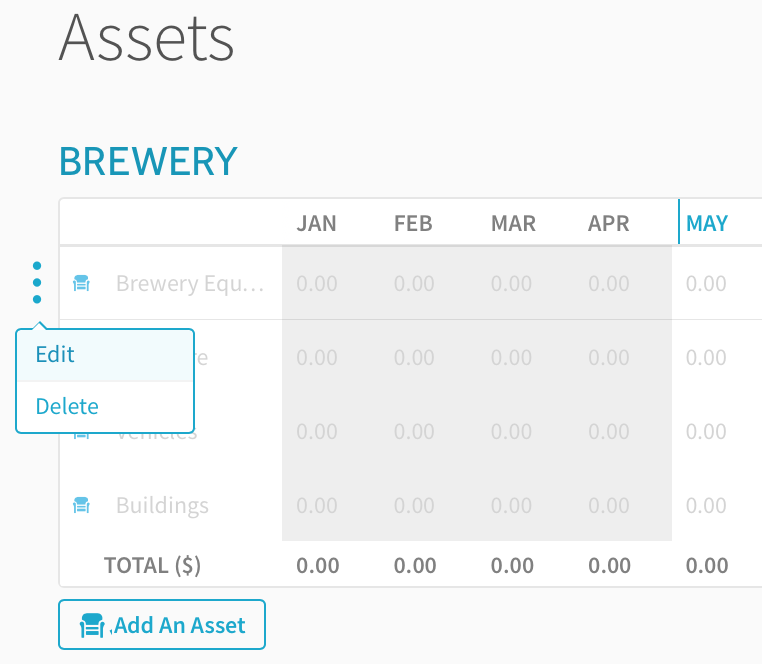 You will notice that the Assets page comes pre-loaded with the default assets that you might have as a Brewery owner. To add an asset, hover over the row, see the 3 dots on the left of the asset name, hover over, and click edit. 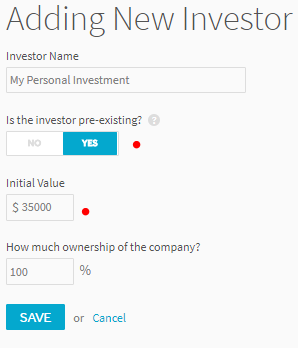 Next you can add any personal investment you will be making as well as investment from outside investors. 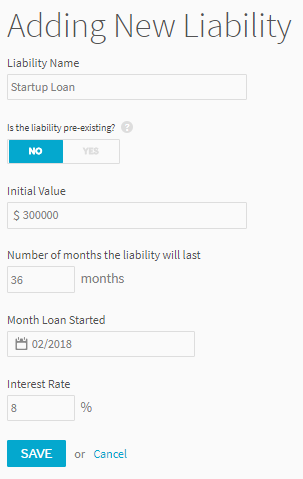 On the Dashboard page you will be able to download your projection Income Statement, Balance Sheet and Cash Flow projections to share with your lender or investor. Finally, let’s assume you want to add another brewery in the future. 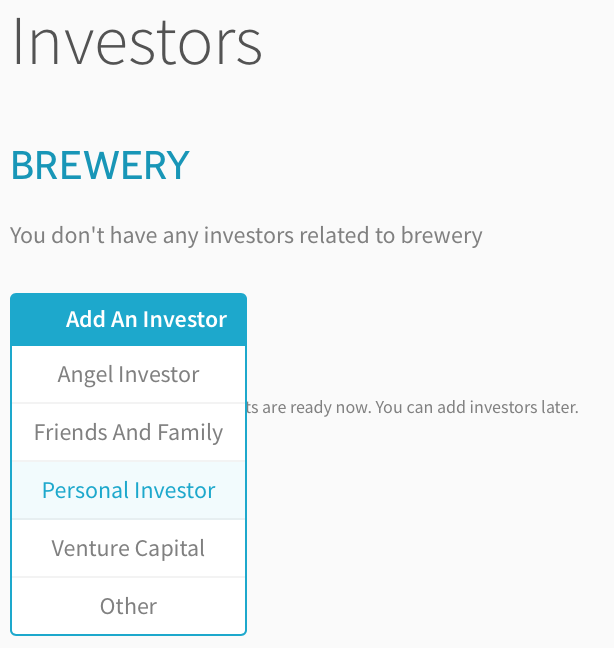 All you need to do is go back to the “Business Model” page and add another “Brewery” business model. You can then label it Brewery Unit 2 and you can repeat the process. You can add as many units as you would like over time. Again, you can get started by creating a ProjectionHub free trial account today.